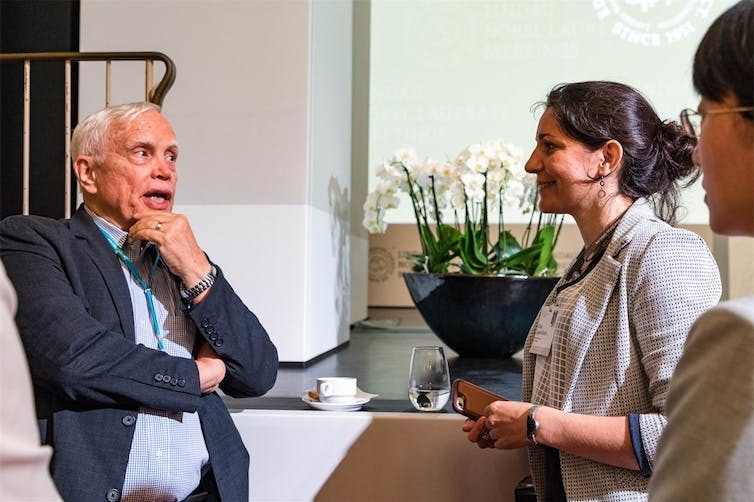 Professor Steve Schifferes writes from the 6th Lindau Meeting on Economic Sciences, where he was invited with other journalists to report on the event and meet with Nobel Laureates in Economics. The event takes place every three years and sees the world's Nobel Laureates in Economics gather in Lindau, Germany, to meet with young economists and discuss the future of the profession. Every three years, all Nobel Prize winners in economics are invited to gather in the tranquil setting of the German island of Lindau to meet a selection of bright young economists and discuss the state of their profession. But this year such tranquility was challenged by worrying political developments across the globe. Perhaps unexpectedly, one of the central themes of the meeting became what to do about inequality. While not all laureates would go as far as Jean Tirole, the 2014 Nobel Prize winner, who said that economic inequality itself is a form of “market failure”, it is clear that the political and social effects of growing inequality are drawing increasing attention from those at the top of the economics profession. In a panel discussion on inequality, James Heckman, the 2000 Nobel laureate, pointed out that inequality had grown faster in the US and the UK than other Western democracies. Heckman said that changes to the tax system that favoured the rich had to be a key part of the explanation. He was also worried about the decline in social mobility, particularly for those on low pay. Heckman also pointed out that the low income of many single-parent families, whose numbers have increased sharply over the last few decades, had also increased inequality. He argued strongly for wage subsidies to boost the income of the working poor, and increased subsidies for childcare to help more single parents enter the labour market. Peter Diamond and Sir Christopher Pissarides, who shared the Nobel Prize in 2010 for their work on labour markets, both told me that they now favoured a universal basic income (UBI), which would give a minimum basic income to all citizens regardless of their economic status. Pissarides argued that the rapid spread of robots and AI is a threat to large numbers of less-skilled jobs. Without some government intervention, this will widen inequality, he believes. He would support UBI as long as it was carefully calibrated to be below the minimum wage to avoid disrupting the labour market. Diamond told me that the growing inequality in the US was now as issue that had to be faced. In a recent paper, he demonstrated just how much the US was an outlier across a wide range of measures of inequality, including income, wealth, poverty and social mobility. Diamond believes that the debate on inequality can help focus discussion on policy failures: from the lack of investment in education, research and infrastructure, to the failure to compensate those who bore the cost of globalisation through job losses in heavy industry. He also argues that direct transfers, including introducing child benefit to everyone who has children and a UBI, would help tackle poverty. While he does not think that the goal of policy should necessarily be focused on redistributing wealth, he believes that the economic challenges in the US require a higher level of government spending, and therefore higher taxation on the better off. Both Diamond and Pissarides are prepared to consider higher taxes on wealth as part of the policy mix. Focusing on the US, Diamond favours a substantial increase in inheritance tax. From a UK perspective, Pissarides argues for some increased taxation of housing. He is in favour of taxing the capital gains from the sales of houses, rather than (at present) only taxing housing when it is inherited. He believes this could also have a beneficial effect on house prices, which are becoming unaffordable for many young people. While much of the meeting focused on inequality in rich countries, the question of inequality in developing countries was not ignored. Eric Maskin, the 2007 Nobel laureate for his work on mechanism design, pointed out the paradox that while global inequality between countries was narrowing, due to the rapid economic growth of China and India, it was “deeply troubling” that inequality within developing countries was increasing. Maskin suggested that this was in contradiction to the widely held economics theory of comparative advantage. This is the idea, put forward by economist David Ricardo in the 19th century, that the wages of unskilled workers in poorer countries rise as they enter global markets. Maskin suggested that this no longer holds as we now have an integrated global labour market – not a national one – with global supply chains and communications networks enabling companies to ignore national boundaries. One of the purposes of the Lindau meeting is to encourage younger economists to think radically about what new areas of research they should focus on. It may be that these discussions will inspire the next generation to develop new policies to tackle the challenge of poverty and inequality. Economics has often been characterised as the “dismal science” for its failure to engage with real-life issues or prevent crises like the 2008-09 global financial crisis. If this new approach takes hold, this could radically change. Steve Schifferes, Professor of Financial Journalism, City, University of London. This article was originally published on The Conversation. Read the original article.